Paul Robinson saluted the 10-man Hawks’ spirit after earning a precious National League draw against Dover Athletic. 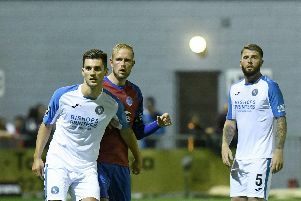 The Westleigh Park side were forced to play more than half of the game with a numerical disadvantage following the dismissal of Chris Robertson. The on-loan Swindon defender was sent off on his home debut for a second bookable offence 10 minutes before half-time. The situation looked desperate for Lee Bradbury’s side but they rose to the challenge magnificently to earn a 0-0 stalemate. The Hawks produced a gutsy, brave display and fully deserved to pick up a point. They even went close to snatching what would have been a remarkable victory. Injured player-coach Robinson praised the Hawks’ work ethic after watching from the sidelines. He said: ‘The boys were fantastic and put in a real shift. ‘It is tough when you go down to 10 men because you have to find the extra running and work-rate to cover. ‘They did brilliantly and it shows the team spirit among the lads. ‘We defended well and the players showed they are prepared to put their bodies on the line. ‘It is a really positive clean sheet and everyone gave it their all. Robertson picked up his first caution for a mistimed tackle on the edge of the Hawks’ penalty area. He was always going to be vulnerable after that. On 35 minutes his second yellow card was inevitable when he pulled Jamie Allen back as the Dover man broke into the home half. For the rest of the opening period, the Hawks were pinned back by the visitors intent on exploiting their extra-man advantage. As a result, Bradbury reshuffled his pack by sending on defender Jordan Rose in place of striker Alfie Rutherford at the interval. And the tactical change came to fruition. Although Dover continued to dominate possession they found it harder to create goalscoring opportunities. Their best chance fell to Jai Reason but home keeper Ben Dudzinski stood strong to block the shot. And Robinson heaped praise on the non-stop midfielder. The ex-Pompey captain added: ‘Wes is unbelievable. ‘He has no-stop energy and goes and goes and goes. ‘Towards the end he was out on his feet but he is so infectious throughout the team. In a grandstand finish, the Hawks went close to snatching an unlikely three points. Rory Williams curled a wicked corner against the woodwork and a goal-line clearance denied Matt Paterson. The draw keeps the Hawks in 18th place and three points above the National League relegation zone.